These are the top 3 skin woes affecting Asians, in alphabetical order. For Acne, learn the ABCs of it here. In this article, we will discuss eczema and urticaria. These include defects in skin barrier function making the skin more susceptible, and a host of genetic and environmental factors. Careful combination of steroids and moisturisers for treatment. Maintainence would include watching out for triggers like excessive hand washing AND extreme temperatures. Urticaria is a response characterised by hives and mucosal swelling. It can be acute or chronic. Acute urticaria can be induced by the following triggers. 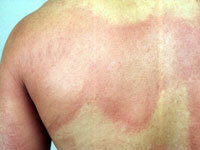 Chronic urticaria occurs in people with underlying infection / autoimmune conditions. How can we treat urticaria? Antihistamines and avoiding the offending agent is the key for acute urticaria. The above is a fairly comprehensive overview of common triggers.